The fine people at Visual-Literacy.org have come up with some great ideas for representing information in fresh and intersting ways. 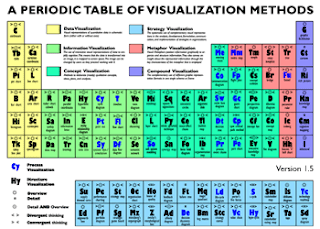 A highlight from their website is this Periodic Table of Visualisation Methods. When you click through to the page you can mouse over each of the elements and get a floating summary and images of the technique in play. If you are stuck for ideas in your next presentation, or want a new tool for a workshop check it out.